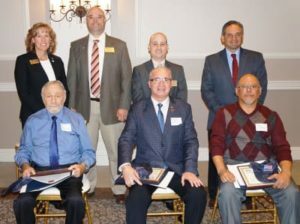 SNJS would like to congratulate Freddie Claudio, a dedicated, long-time employee, for being honored by the Greater Vineland Chamber of Commerce at the 3rd Annual Veterans in Business Event. Freddie served in the United States Marine Corps and began working for SNJS shortly after his return. Throughout the years, Freddie has participated in numerous community service events, most notably Toys for Tots and the 3 Kings Program, celebrating Hispanic culture. He is an exemplary model veteran who continually serves his family, community, and country and we are very proud of him for this recognition.